Remember last week when I said I wouldn't get another bronze 2 rank in squad battles and that I would get higher? Well it didn't happen. Even though I had the week off I was too wiped out to game plus I just couldn't get comfy. However, I did manage to get one game in which lead me to bronze 2. 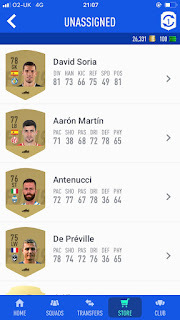 So here is what I got in my gold pack rewards. 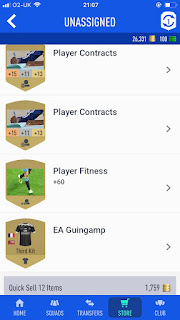 I played the Billie Eilish match and won so one reward was that kit, it is actually a pretty nice kit so I will be keeping it just in case I fancy a change. Onto the pack I go Pekarik who thanks to him being a RB is being kept, I don't have many RB in my club at the moment. Chester is also staying as I have Williams as a CB too and that CB partnership could work out well if needed. Leko is gone though as I have far too many managers plus I got Klopp at the moment, what more could I need. Squad fitness was of course kept as they always come in handy. 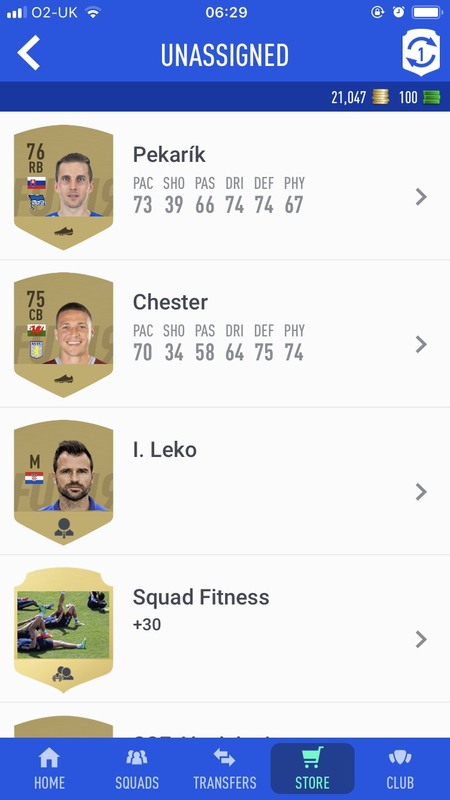 In terms of both league cards they have gone as they just don't fit. 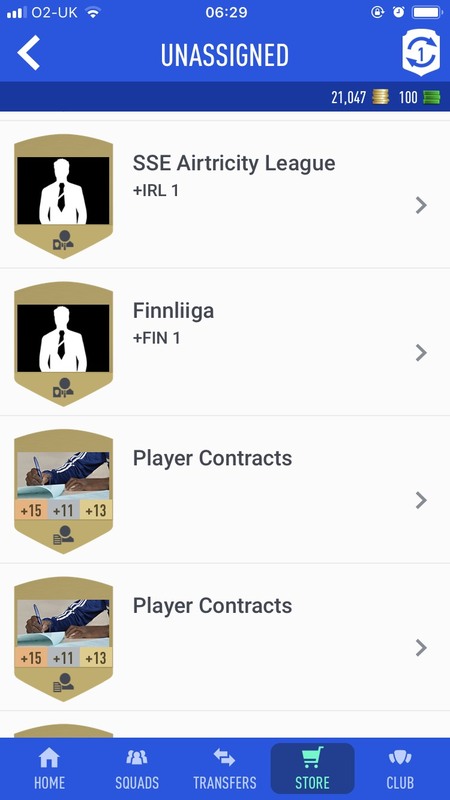 Player contracts once again are being kept as I am forever needing these. Contracts just don't seem to last 2 minutes. It is the same case for the player fitness as it is for the contracts I seem to fly through these but they are definitely really handy as I have a set starting 11 so keeping their fitness levels up is key. 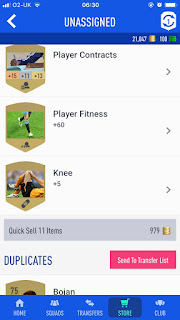 I am also glad I got the knee card too as I have noticed lately that when players are getting injured it seems to be knee injuries, anything that protects my starting 11 is very welcome. 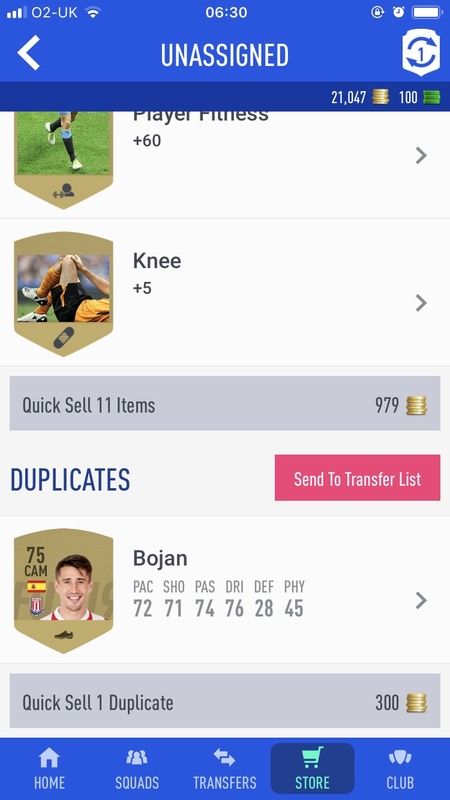 And of course I got a duplicate, Bojan is actually a player who I play quite regularly as he is the perfect fit in my team, he got quick sold on this occasion just to get ride. So there you have it that is what I packed. What did you pack this week? I have recently realised that I need to take some time to step back every now and again just to recharge and get back on track. But in doing this the blog has suffered, one of my goals for 2019 was to blog more but I think I have blogged a lot less, but that is because my recharging time has been me spent watching YouTube instead of gaming to gain content. It has meant I am on the back foot for a lot of my goals, like completing the backlog and gaming more. 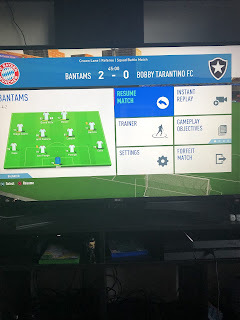 I just haven't had the motivation to game other than the odd few games of FIFA. However, now I am recovering from this operation I have had plenty of time to sit and plan out what I want to do from now on in terms of looking after myself and still doing what I love whilst still getting jobs in the house done. So here is the plan. Even though I have had no motivation to game I have missed it, so from now on when I get the urge to game I aren't going to put it off and do something like go shopping instead. I really don't need to shop half as much as I do and if I stay in and game when I want to, not only will it benefit the backlog but it will also benefit my bank account a lot. 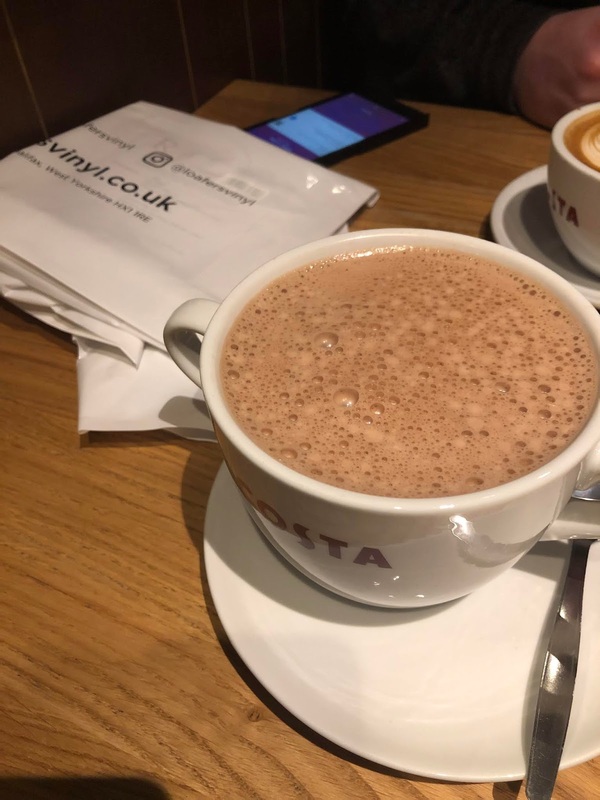 I am getting far too much sleep lately and it is actually making me more tired, so instead of getting straight into bed after work I am going to be more productive by either doing some work on the blog or again doing some gaming. I have found that gaming is a stress reliver for me so I definitely need to do it more often. Another thing I want to do is up my blogging game, which will mean that even if I am doing little bits on it each day I will still have either a Saturday or Sunday just dedicated to blogging i.e getting images together, planning the following weeks posts and getting as many posts written as possible as well as working on future ideas and content, making sure anything important is written in a to do list or on the relevant date in my diary. There will be no more weeks where I go completely off the radar (I hope). I also want to make sure I am continuing with current series I have going on such as my top 5's and content creator interviews. Lately I have been terrible at getting my ideas down and by the time I get around to working on the blog my ideas are gone, but hopefully that will be a thing of the past. Keep an eye on the blog too as I am thinking of changing up its look a little. There is just one thing I want to do in the games room and that is run an ethernet cable to my PC as the current internet is absolutely terrible in my little corner. I am hoping once the ethernet is in speeds increase and I can get a lot more out of my PC. The ethernet cable brings me onto my next thing I want to do... finally start Twitch and possibly YouTube. 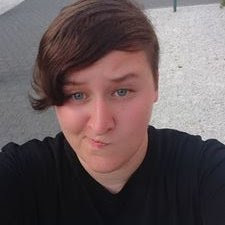 I recently asked about streaming direct from my PS4 which I am hoping to get set up soon but I also want to get full use out of my gaming PC and stream from their too. I have been looking at equipment to get me started from the PC and can't wait to get going once this internet issue is sorted. Fingers crossed I can get streaming very soon, I am looking at possibly starting off with FIFA and then mixing it up every now and again. With Liam now working every other Saturday this could be the perfect time to get any streams done and possibly record some YouTube videos, the videos/streams won't be spectacular as I am pretty rubbish at all games but I am hoping they are going to be fun. So there you have it that is what I am hoping to do now I am coming back to the blog and learning to recharge as I go along. If you have any recommendations for any posts you would like to see, equipment I should get or games I should stream/record please let me know. Been Watching: Thanks to having the week off I have had plenty of time to catch up on YouTube along with watching far too much Keeping up with the Kardashians. Been reading : It would have been the perfect time to read with so much spare time but the thought never crossed my mind. Been Playing: I couldn't get comfy enough to get settled and play anything other than a few games of FIFA. Been listening to : Thanks to the gig on Wednesday all I listened to all week was Shawn Mendes. Bought : I got quite a few new clothes to rebuild my wardrobe with, some bits at the gig and some bits from the Disney store. I also got Liam assassins creed Odyssey for his birthday. Plans for this week : I get my staples out Thursday and have Friday off work so I am hoping I can get comfy and spend that time off gaming, I am also hoping for plenty of gaming after work and on the weekend, seen as I can't do much else for a few week. I finally have Pulisic granted he may not be a very good card for some but he is one of my favourite American players, in fact he is one of the reasons I actually watch USMNT games. I think he could partner pretty well with Dom Dwyer when I fancy changing things up. 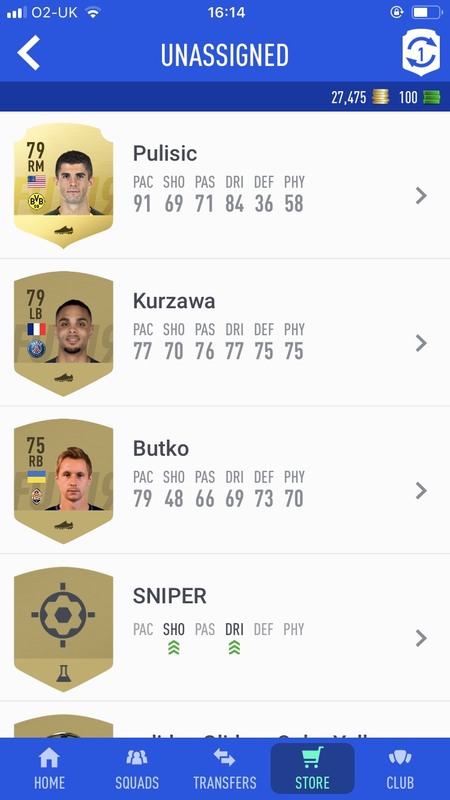 I also packed Kurzawa the PSG player who can always be rotated into my team as I really lack in the LB position. 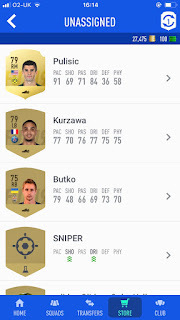 There was also a Butko RB card in this pack, the Donetsk player could also come in handy so I can switch between him and Coke when I fancy it and change up my team every now and again. I also got the Sniper card which is definitely being kept as I barely ever manage to pack this and it will come in very handy. 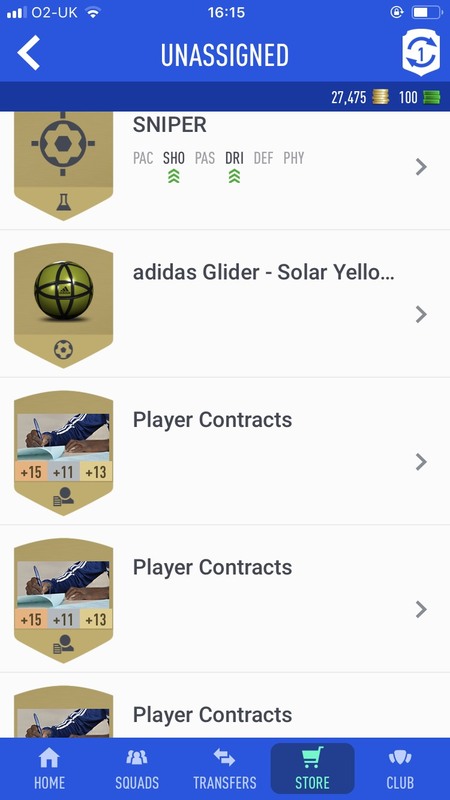 The Adidas glider ball is one I always seem to pack and one that goes straight back out through quick sale. I aren't too bothered by what ball I use during games. 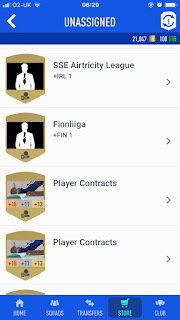 Obviously all these player contracts where kept too as they are always required especially how I have a specific set of players I use more often than others. 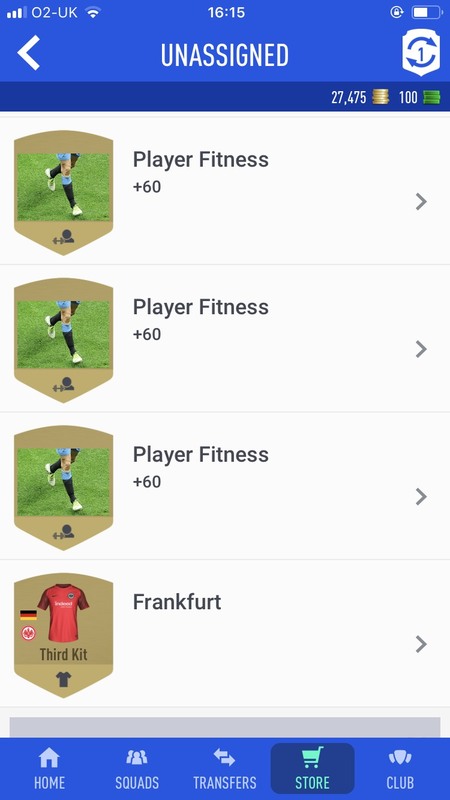 I have finally started using the player fitness cards that I get and it is making a world of difference to my team. So from now on I will actually be making sure I keep all these cards and actually put them to use. 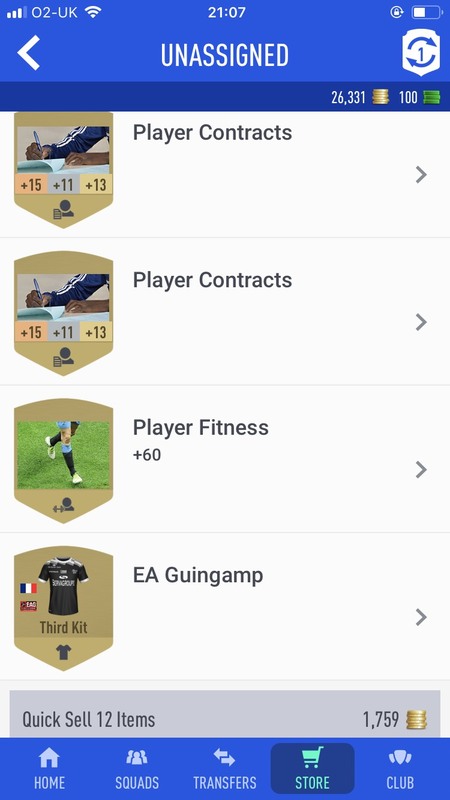 The Frankfurt kit is going though as I already have too much of a collection of kits going on yet I use the same few all the time. So there you have it that is last weeks rewards, I am hoping whilst I recover from this surgery I can get plenty of FIFA time in and build on those ranks. I am also hoping having the week off helps me get more content typed up and posted on here. So keep your eye out for those. 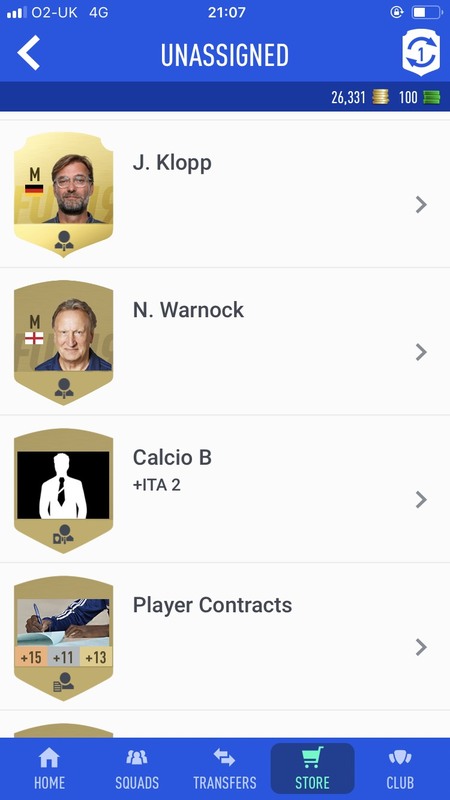 First up with the players I received I actually don't mind them and they will come in handy. I basically have a full Spanish team now so the GK and LB will be great back ups. However, I am always short of LW players so De Preville may come in handy whilst I am playing around with the team. It was nice to see a name in there too that I knew, Antenucci is ex Leeds so it is a name I was used to hearing and who knows he may fit into my plans one way or another. Now this next lot is what really made me smile. One of my favourite managers in the Premier League at the moment is Klopp, I definitely aren't Liverpool's biggest fan but you can't deny that Klopp hasn't worked wonders with the team. He will definitely be getting used. Next up is Neil Warnock one of the managers who seems to have been around forever, you can't knock Warnock as a manager as he has helped out so many teams over the years and has had an okay career plus he's a Yorkshire lad so I am definitely keeping him. 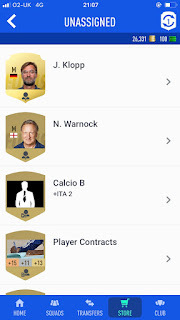 Calcio B is the only card I actually got rid of this week as it just didn't fit my plans anywhere. Of course my player contract had to stay as they always come in handy. 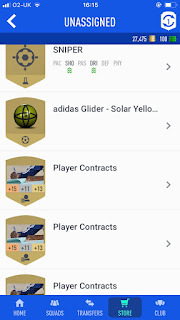 All the cards in the above image also stayed like I said in the above they always come in handy plus it is always nice to be able to change kits around every now and again. So there you have it those are my rewards from last week. What did you manage to get? If you remember I recently posted my Backlog to clear challenge for the first half of the year (you can catch up on it here) and thanks to this challenge I also made myself a promise. I have to complete the story of at least 5 games until I can buy a new one... so how am I doing with this little challenge? We are nearly at the end of the 3rd month of the year and I have bought 0 games. Although there are plenty of games out there tempting me I have managed to remind myself I have plenty of great games sat on the shelf that need to be played first. 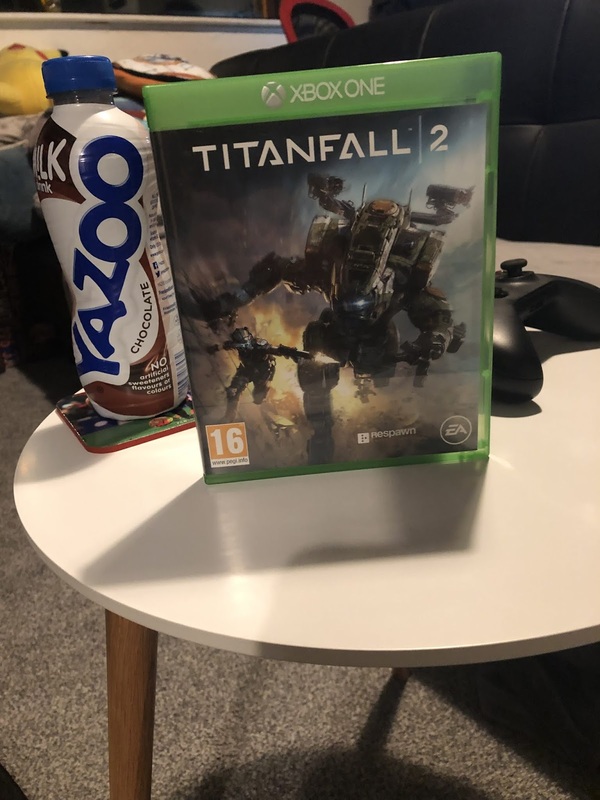 As it currently stands I have only completed Detroit Become Human and have made a start on the Titanfall 2 campaign (still a long way to go). Which means I am still a long way off picking up anything new, I recently fell out of love with gaming for a bit but that was due to personal reasons and I am slowly getting back into it again. Although I have fallen into the trap at the moment of just playing FIFA, which I need to get out of again. Fingers crossed over the next month or so I can increase the games completed to at least 4, by finishing off a few games I have already started and getting that backlog decreasing a little more. I think once I hit those 5 games completed I will be treating me and Liam to Red Dead Redemption 2, as every time we see it we say how much we want to play it. I am hoping to be posting more regularly on here to as I go through the games, doing quick or in-depth reviews on what I have played alongside upcoming release and maybe some mini series I am working on. So keep checking back for more posts. Finally my love for gaming is returning slowly but surely. Recently I have had such a lack of motivation that I had been going home from work at 5pm and crawling straight to bed, doing nothing for the rest of the night. But since Sunday I have finally got a little bit of the gaming bug back and have been heading into the games room a lot more. Here is what I have currently been playing. You may have seen in my Backlog to clear post I was hoping to get through the campaign in Titanfall 2. I have made a start on this although I am nowhere near finishing it I am enjoying it so far. I wouldn't normally aim to complete a campaign on a game like this but I am not giving up on this I am enjoying it so much. I am hoping to get through another chunk of this throughout this week before I switch back to the PS4 for a bit. Who knows by the beginning of April I may have actually ticked this game off the list. I have also jumped straight back into FIFA and I have definitely missed it a lot more than I expected. I have restarted the journey and have also been building up my Ultimate Team, which needs a lot of work still. FIFA is that game for me which I will forever go back to as I just never get bored of it. I think this is one of the games I will be playing the most of next week. So those are the games I have been playing to date however, with my operation on Monday we are bringing the PS4 downstairs so I can game away all week. I am thinking about trying to get through as much of the Kingdom Hearts series & Horizon Zero Dawn as I can within that week. 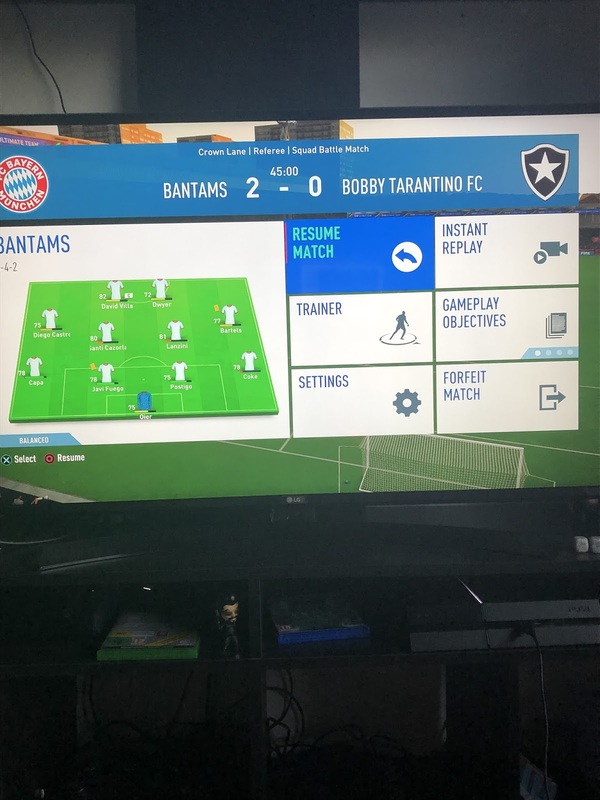 Obviously FIFA will be played daily too. © TheNorthernGirl Games. All rights reserved.